VIBHA 2K18- College Annual Day celebrations was conducted on 27th & 28th march, 2018.Live Singing concert by mr.Hemachandra, Ms.Sravana Bhargavi, Mr.Yasin Nazir, Ms.Sameera Bharadwaj was organized. VIBHA 2K17-Annual Day Celebrations of VBIT was conducted on 12th & 13th April, 2017. Sri. Aravinda Rao, Former DGP was the chief guest on this occasion. 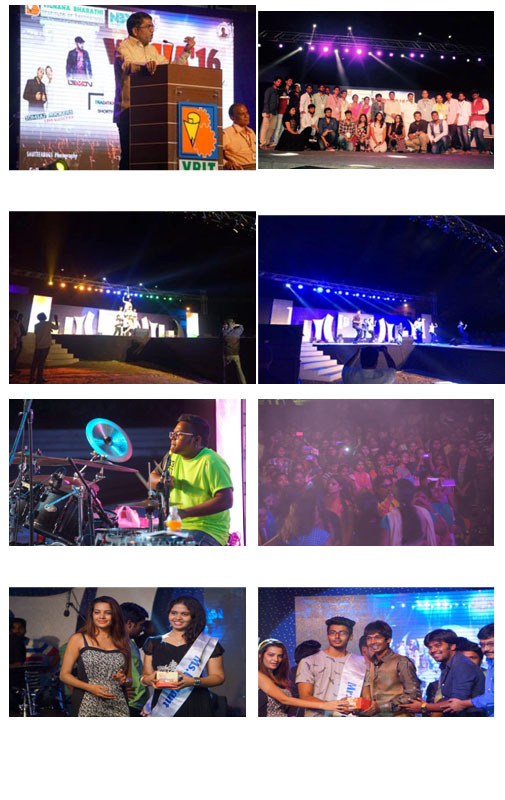 Live concert by Tollywood Singers Ramya Behara, Deepu, Suraj santhosh & Bhargavi pillai was organized. VIBHA is an annual technical and cultural fest conducted in VIGNANA BHARATHI INSTITUTE OF TECHNOLOGY, Ghatkesar,to facilitate the students to showcase their talent and innovation. The mega annual event of VBIT, VIBHA -16 is held this year for three days i.e., 11th, 12th and 13th of April 2016. Day II and III were vibrant with all the students and the staff members turning up in ethnic wear. All the students made merry by indulging in delicious food on offer in a large number of stalls arranged and by watching several music and dance programmes performed by the short-listed student groups. These two days turned out to be all fun and frolic to the students and faculty alike as a host of cultural programmes were performed. Dandiya Night, several foot stomping music and dance numbers and highly entertaining programs were performed. 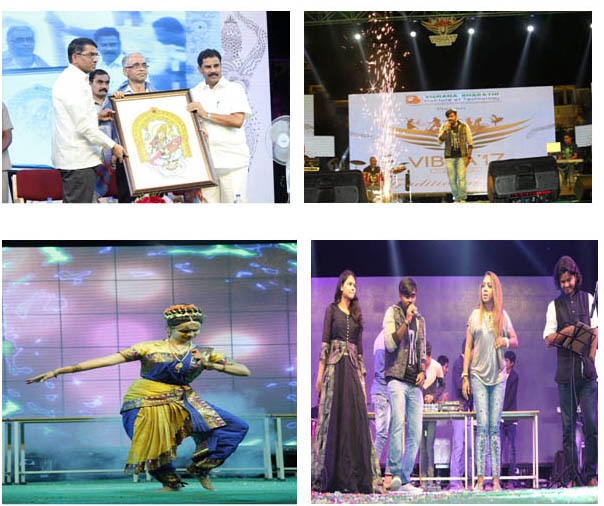 DJ Night by Bollywood DJ Lemon, a concert by Bombay Rockers group and a performance by the ‘Jabardasth’ team electrified the atmosphere. Mr. DKM Sharma, Ms. Swaroopa, faculty members of English and Mr. K. Sireesh, faculty member of Chemistry were the Convenors of Vibha – 2k16. Ms. Ashwini and Ms. K. Apoorva together with a few final year students took good care of the execution of the entire programme. 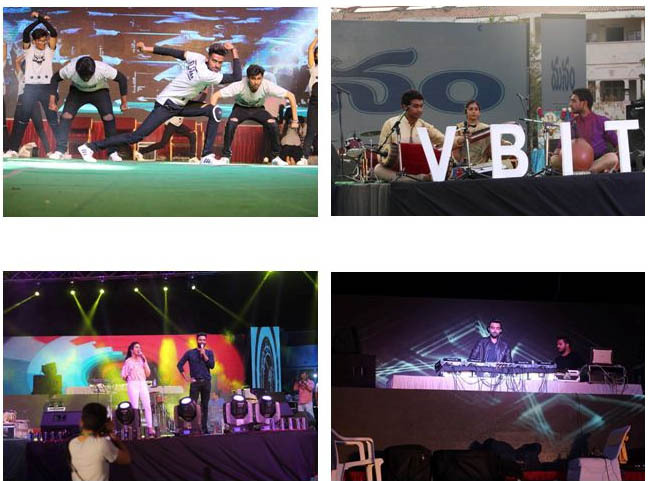 VIBHA-2k15 annual day celebrations of VBIT was conducted on 17th & 18th April, 2015.